The Hudson Valley Conservation Strategy (HVCS) is a rigorous framework for landscape-scale conservation in the region that meets multiple ecological objectives. It is a tool that transforms land protection efforts by identifying the most efficient and synergistic network of properties for conserving long-term climate resilience, biodiversity, and landscape connectivity across the Hudson Valley, including productive and scenic working farmland. Worldwide, the conservation community is grappling with the challenge of ensuring that species and habitats have the ability to adapt to climate change, which is essential for their—and our—long-term survival. The biological richness and ecological function of the Hudson River Valley face unprecedented challenges due to climate change, sea level rise, habitat fragmentation, and the loss of productive farmland to development. To address these threats, and to safeguard the region’s resilience in the face of climate change, Scenic Hudson designed the Hudson Valley Conservation Strategy (HVCS) to complement and build upon our existing conservation strategies—the Saving the Land That Matters Most campaign, the Hudson Valley/New York City Foodshed Conservation Plan, and the Tidal Wetland Adaptation Framework. In addition, it incorporates the most current and rigorous regional climate-resilience and natural resource datasets generated by non-profit, state agency, and academic partners. Using Marxan, a leading systematic conservation planning tool, Scenic Hudson’s scientists and geographic information systems experts used an array of datasets to identify and prioritize the most efficient combinations of potential land conservation projects that will achieve explicit targets in three categories. The categories are: biodiversity (the variety and variability of life on earth); climate resilience (the capacity of a site to adapt to climate change while still maintaining biodiversity); and landscape connectivity (the degree to which landscape conditions facilitate or impede the movement of organisms and resources between large habitat blocks). Additionally, data from Scenic Hudson’s Hudson Valley/NYC Foodshed Plan was incorporated to identify and prioritize productive farmland, while simultaneously ensuring climate resilience, landscape connectivity, and ecological complexity and function. The HVCS represents a significant advance in integrating The Nature Conservancy’s Resilient Sites for Terrestrial Conservation data with other data sources to create actionable goals for conservation investments in the Hudson River Valley. 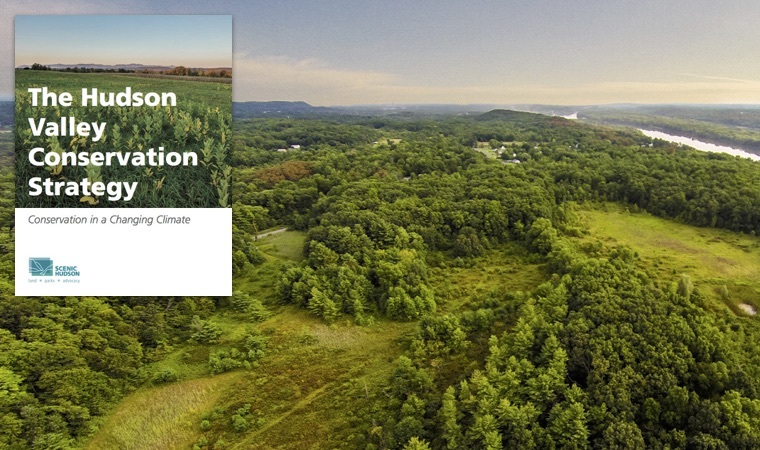 In all, the strategy points to approximately 760,000 acres in the 11 counties of the Hudson Valley region that represent the best potential conservation investments for achieving a resilient, functional, and productive landscape. The HVCS represents a durable and dynamic planning framework: it builds on existing protected areas, and is easily updated to incorporate newly conserved lands, new data on natural resources, shifting priorities, or other revisions to the strategy. The resulting HVCS can be implemented by Scenic Hudson and its conservation partners in the region, and supports efficient, coordinated action across the landscape. It promises to optimize the conservation value of open space investments, and creates a strategic framework for Hudson Valley conservation that supports the diverse missions of individual land trusts and land protection agencies while aligning the investments of these multiple actors for the greatest collective impact. A detailed report outlining the HVCS is available as an interactive online report (with clickable results maps) or as a 32-page PDF file. Printed versions can be requested by contacting jmudd@scenichudson.org. The Doris Duke Charitable Foundation has generously supported Scenic Hudson’s development of the HVCS, in both its initial conception and its current implementation.